Today marks the second time this week I tried to paint en plein air while fishing in a Colorado mountain pond. This time I clipped a small bell to the end of my rod so I could stare at the landscape and try to paint, merely listening for the occasional strike. As it turned out, it was a good day for fishing as I managed to land seven rainbows. The painting was a tad more difficult as I began with the sun drenching everything before me beautifully, then, within thirty minutes, the skies darkened, the landscape lost all highlights and shadows and intensity of color, and the temperatures dropped into the upper thirties. And then it rained on us. Nevertheless, I enjoyed the experience of trying to capture what lay before me. 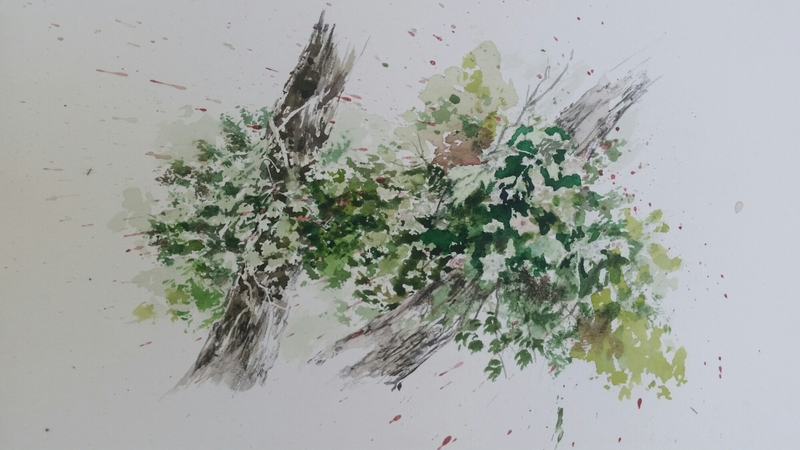 When I began this work, the dead tree in the heart of the composition was almost white against a brilliant forest, and the sagging limbs looked like the ribcage of a skeleton. So I used my masquepen on it, which is tricky at this altitude–the fluid bubbles out of the steel nib uncontrollably, and I had to scribble fast and loose with it. Then when it was time to replace the lid by inserting the pin into the nib, that proved difficult because the fluid continued to dribble out of the nib; there was no stopping it. Then, when the skies darkened, the dead tree all but disappeared into its surroundings, taking on a dull warm gray. I chose to keep it bright against its background and tried to keep my colors intense, though they were no longer so in the reality that lay before me. Such are the experiences of doing plein air in the midst of a living environment. I hope that what I’ve just written hasn’t come across as negative. The day was beautiful even if the weather and environment didn’t pose still for me. When I gaze into the glories of mountain scenery I cannot help but wonder what I ever could have done to deserve such a Gift. Emerson got it right; this was a holy place and I felt nothing short of reverence as I stood enveloped in it. I’ve always said my favorite past times were fishing and plein air painting. This week has marked the first time I have tried to do both simultaneously. And it was a joy. When I began plein air painting about seven years ago, the first lesson I had to learn was to abstract from the visible world that overpowered my vision and intimidated me before my easel. Robert Motherwell wrote that “abstract” comes from a Latin word meaning “to take from”, and that a painter abstracts every time s/he selects an object and reconstructs it on a two-dimensional surface. When I stepped out of my vehicle at South Fork, Colorado last weekend, I was overwhelmed at the complex beauty of this mountain environment that I have enjoyed for over a decade now. 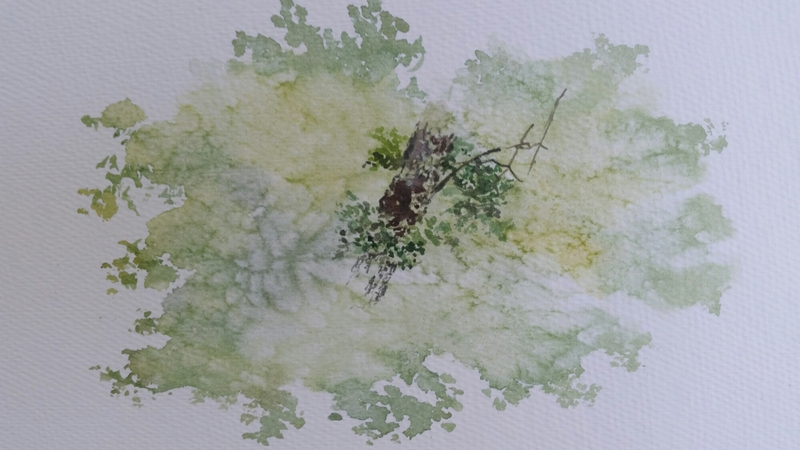 This was the first time I was determined not only to bring along my art supplies, but to give plein air just as much attention as trout fishing. The first object I selected was a solitary pine tree directly in front of my cabin porch. I sketched it in pencil the first afternoon I was here, and mosquitoes chewed me up as I worked quickly. After several subsequent days of sketching forests and mountain bluffs, I returned to this lone pine and gave it my full attention after lunch today with my friends. Annie Dillard’s references to the “color patch” in her excellent book Pilgrim at Tinker Creek flooded my consciousness this afternoon as I stared at this tree and attempted to capture the colors threading through the bark and the limbs. Much of what Annie wrote about the “color patch” reminded me of ideas gleaned from Paul Cezanne and Camille Pissarro in the early days of French Impressionism. The longer I stared at this tree bark the more amused I was at recalling Jasper Johns’s statement that an artist paints things that other people look at but never see. It was true that I was indeed seeing the bark of a pine tree for the first time up close in concentrated study. I still have so much to learn. Looking back over this past week, I can honestly say that I have not been as successful fly fishing in the stream as I’ve been in previous years here, but I’m willing to chalk that up to high waters and very fast currents. I refuse to feel badly about that because I am delighted that I’ve had the finest opportunities for plein air painting, and I’m so glad I took advantage of those opportunities. I feel I have learned a great deal, just as I did recently while spending a week on the island in the Laguna Madre. I’m certain that my studio work will improve as a result. Poets talk about “spots in time,” but it is really fishermen who experience eternity compressed into a moment. A cool, hard-driving mountain rain has driven me back indoors after a day and a half of fly fishing and plein air painting. So, I’m going to record some of the wonders that have come my way since my last posting. I rose early yesterday morning to see a group of men standing in the stretch of waters below my cabin, casting spinning reeels in all directions with lures flashing so large I could see them at 100 yards. They talked so loudly I could hear every word from inside my dwelling. I had planned to enter that space myself, but realized it would be awhile before the area settled down. So . . . making coffee, I sat at my kitchen table and did some necessary tasks–rebuilding my tapered leader that has taken a beating over recent years. The nine-foot leader had been chewed down to about five feet. Finding some 3x tippet, I spliced three more feet onto it, then added another two feet of 5x tippet to get the leader back to its desired length. Hearing the continuing clattering conversation of the three clowns below who were catching nothing, but slashing the hell out of that stretch of water, I decided to make some decisions while sorting through my flybox. I tied on an elk-hair caddis dry fly, rubbed flotation fluid into its hackles, then added another 18″ of 5x tippet, tying it onto the bend of the hook, and finally tied on a bead-headed Copper John nymph. Out on the porch, I pulled on my waders and boots, and seeing that the men were still busy thrashing the waters, I decided to hike 200 yards downstream where the river was deeper, darker, and much swifter. The wading proved treacherous and arduous, and I hadn’t forgotten the soaking I took last Saturday when I tried to navigate these waters. I did manage to work a couple of decent stretches of stream, managing only a couple of strikes on the dry fly, which I missed, having too much slack in my line. Finally, the last man left my preferred stretch, so I waded slowly upstream to a marvelously wide, sun-filled flat stretch of shallow riffles. The voices of the subterranean river in the shadows were different from the voices of the sunlit river ahead. In the shadows against the cliff the river was deep and engaged in profundities, circling back on itself now and then to say things over to be sure it had understood itself. But the river ahead came out into the sunny world like a chatterbox, doing its best to be friendly. It bowed to one shore and then to the other so nothing would feel neglected. It took very little time to land three brown trout, all of them under ten inches, but I was thrilled to see them all take the dry fly. Though the fish were small, the waters exploded every time they took the surface fly. Realizing the sinking nymph was getting no action, I clipped it off, then continued to move upstream, fishing the dry fly only. For about an hour, I managed to miss about ten strikes, most of them large browns, because I could not strip the slack out of my line quickly enough. The waters are still very high and fast. The snow melt is still running its course. I’ve never before seen so many snow packs in the mountains this time of year in Colorado. Nevertheless, I found my time on the river very intoxicating, as I listened to the waters flowing swiftly over the smooth rocks. The wonderful thing about the cabin where I am staying is that it is so close to the river that I hear the sounds of the rushing waters around the clock. They soothe me to sleep every night, and greet me in my first waking moment of the following morning. The river was cut by the world’s great flood and runs over rocks from the basement of time. On some of the rocks are timeless raindrops. Under the rocks are the words and some of the words are theirs. 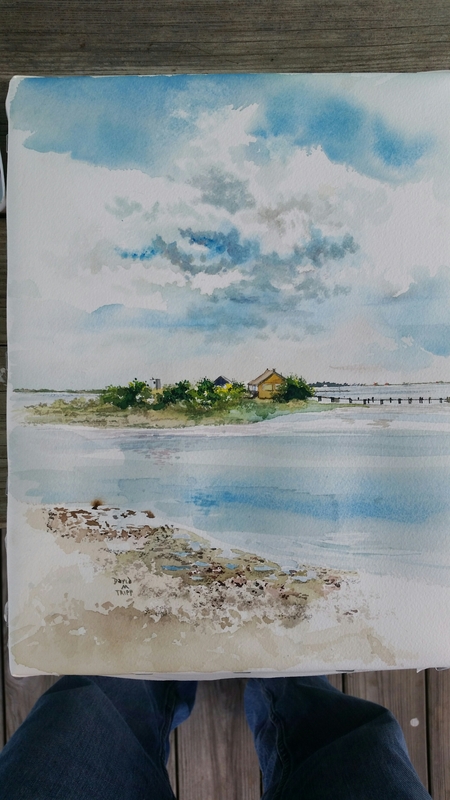 Today I decided to put off my river excursion until this evening and instead focus on plein air painting throughout the morning and early afternoon. (Now that the hard rains have arrived, I question whether I’ll get to enter the river today at all. We’ll see.) From where I am residing, I look daily across Highway 160 at this line of towering bluffs, and am fascinated with the striations in the rocks as well as the trees that crown them. The sky constantly shifts back and forth from deep clear blue to cloud-stuffed. I managed three quick watercolor sketches today on 140# stretched D’Arches cold-pressed paper. I tried to begin a fourth, because the dark storm clouds framed up a deep colorful composition along the bluffs. However, I needed to stretch more paper, and after stretching three more surfaces, the first of the hard raindrops fell, and I had to scurry back into the cabin with all my supplies. The rain has ceased and the Colorado landscape is showing some light once again. I began a watercolor sketch of the pine tree in front of my porch a few days ago, but never returned to it. I’m going to resume it now, and see if I can get back into the stream later. Thanks for reading. It’s been a magnificent pair of days. Geez! Fumbling with my Phone while Plein Air Painting and Trout Fishing! Even a soul submerged in sleep is hard at work, and helps make something of the world. Sleep did not come easy last night as my mind flowed with a myriad of thoughts and would not shut down. Yet I awoke at 5:00 this morning, filled with a spirit of expectancy, believing that today was going to be an excellent day. Sitting on the front porch with a cup of coffee and Annie Dillard’s Pilgrim at Tinker Creek, I enjoyed the snap to the air with temperatures hanging around 45 degrees. I read until Ron and Dian picked me up at 6:45 and we embarked on our 45-minute drive up to an altitude of 9600 feet and temperatures registering 38 degrees. Tucker Pond was beautiful with the mist rolling off its surface and trout constantly roiling the waters. Multi-tasking seems to be my way of life. I set up the easel as soon as I had my line cast into the waters. Sure enough, just as I finished blocking in the sky, my rod jerked hard, and I saw a rainbow about 18 inches long fighting for his freedom. He won, as I was too impatient to play him out, trying to put a net on him when he still had plenty of strength. I knew better. On a more positive note, I always think trout are easier to cook when smaller anyway. As I painted the morning away, I would lose several quality trout as they struck and stole my bait before I could lay down the brush and take up the rod. Nevertheless, we intended to take four for our evening meal, and we each managed to land a pair. The entire time I gazed into the forest adjoining Tucker Pond, I thought of what I was reading from Annie Dillard about “color patches” and the way it reminded me of Paul Cezanne’s theories of color when painting in plein air. I was smitten by the sight of the golden greens in the pine trees and how they contrasted with the blue spruce colors. The rose colors of the distant mountain to the left of the forest also held my attention. The morning was everything I had anticipated when I awoke with a sense of gladness before dawn. The present of my consciousness is itself a mystery which is also always just rounding a bend like a floating branch borne by a flood. Annie sure nailed it with that sentence in describing my life. As an educator, I’ve encountered for twenty-eight years students diagnosed with A.D.D. (attention deficit disorder), and have felt that I would have been diagnosed with the same, had counselors in my own school youth been equipped with that handle. I have told friends for years that when I am home alone in the afternoons and evenings, that I want to work on a watercolor, read a book, and write in my journal all at the same time. If I settle for painting, what should I paint? If reading, what book? If journaling, which thought do I want to explore, right now? I awoke with that dilemma this morning, multiplied to the limits. The Colorado morning light was crystal clear, the air was cold, Annie Dillard’s Pilgrim at Tinker Creek was lying beside my bed, my art supplies and easel were in the corner, and the journal was on the kitchen table. And I wanted to do all of it at the same time. During breakfast with Ron and Dian Darr, friends whom I’ve known and loved since 1990, I decided to set up the plein air easel and see if I could do something with those beautiful bluffs across the highway from Riverbend Resort where I am staying. For years I have wanted to paint bluffs, and got my first real taste of a few weeks ago in Eureka Springs, Arkansas at Beaver Bluffs. Last week, west of St. Louis, while driving back toward Texas, I saw those marvelous bluffs carved out along Highway 30 between High Ridge and House Springs–a sight I took for granted during my school years but now was just screaming to be painted. Last year, I began a painting of one of those bluffs, and it still sits in my studio, unfinished (that’s my life–a studio littered with half-done projects). After stopping with the first sketch above, clouds rolled up over the mountain, so I decided to begin a second one. However, the temperatures grew quite hot as the noon hour approached, and I decided to put this second one on hold. Perhaps tomorrow I’ll return to it. The third pencil sketch was something I dashed out while chatting with Ron under the shaded canopy. The day has been amazing. I haven’t yet entered the stream to fly fish, but plan to as soon as the sun drops in the early evening. Meanwhile I’m staring at this magnificent pine tree in front of my cabin porch–the one I sketched yesterday while mosquitoes ate me. I have the repellent today and have already bathed my body in it. Perhaps I’ll give the pine a try in watercolor . . .
Something spiritual and exciting floods the atmosphere in Colorado. I rose at 5:09 yesterday morning, and 5:05 this morning, unable to sleep any later. The world outside is already filled with bird choruses, the South Fork of the Rio Grande is never quiet as it flows over the boulders below my cabin, and I cannot picture a better morning than one spent in the halo of my desk lamp with a cup of coffee and Annie Dillard’s writings, waiting for the light to break. Plein air painting, fly fishing, reading and journaling are on my mind while I spend quality time here. Yesterday was busy with driving the final six hours to this destination, unloading, moving into my cabin and getting into the river. The water is way up from what I’ve been used to in years past, as the snow melt is still underway and daily rains have added to the flow. Entering the stream proved difficult and treacherous, as I managed to slip and fall headlong already (an early baptism), but did manage to bag a beautiful brown trout, while missing three additional strikes. I would have photographed the trout, but I had returned to the cabin to change clothes and dry out the phone (which fortunately did not die) and deliberately left the phone in the kitchen. On my second stream visit, where I managed to stay on my feet, I found plenty of trout action, and the Caddis hatch was so thick in the air that I dared not breathe with my mouth open. I forgot to pack Off! mosquito spray, so the sketch above had to be done hastily while mosquitoes ate away at my face and neck. By the time I got a can of spray, it was nightfall, so I plan to bathe in the repellent today before going out for my next plein air attempt. The Colorado light is so crystal clear and enchanting, with sun bathing the mountains and stream, that I feel intimidated to sketch it. I’m tingling with excitement as I think of this day’s prospects. The vision comes and goes, mostly goes, but I live for it. I found a scrap of watercolor paper of a different brand than what I normally use, and thought I would experiment with salt and a spray bottle. The exercise yielded some unusual textures that I have come to like, and I began to experiment with some bark texturing and leaf clusters before I lost the light yesterday evening. I am on the road today, so I will not be able to paint as I wish. But I thought I would go ahead and put this picture on the blog. Reading Annie Dillard has given my spirit a real lift this week, and I anticipate more excitement as I get further into her text. I can certainly identify with this notion of inspiration that comes and goes, and I will always be grateful when I feel that special visitation.
. . . the quality of the imagination is to flow, and not to freeze. The poet did not stop at the color, or the form, but read their meaning; neither may he rest in this meaning, but he makes the same objects exponents of his new thought. I don’t recall my last blog post, as life has been a blur for over a month now. 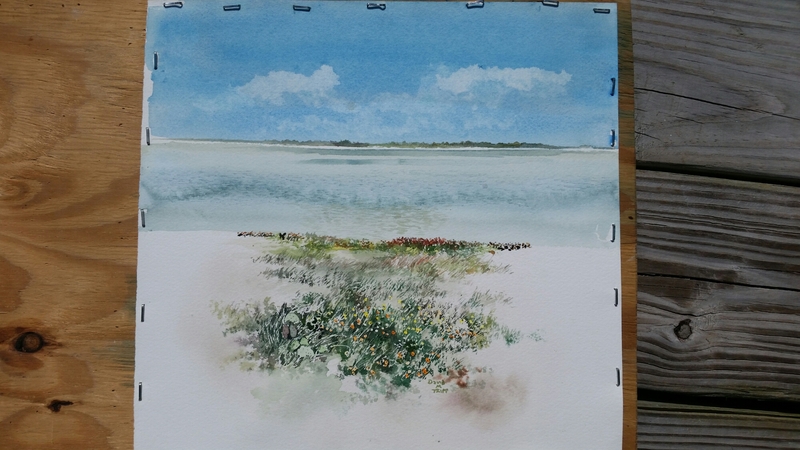 Two excursions to Arkansas, finishing school, dashing to the island on the Laguna Madre, and then driving to St. Louis–all these events have compacted in such a way that I reached a point where I needed to stop, regather some quiet around me, read some books, scribble in my journal, and attempt some new sketches and watercolors. The blog silence was not an indicator of discontent, but a dearth of ideas and paintings to share. I’m now posting some sketches I’ve attempted the past few days. I’ve had little space around me to think and write as I wish, but have been nourished with some quality reading of late that I look forward to sorting and sharing soon. As to painting, I’m experimenting with some pigments I haven’t used in over five years–burnt and raw sienna, raw umber, permanent sap green and Chinese white gouache. I’m looking forward to seeing what they yield. I started this painting yesterday evening, and was really getting into it when the light went away. Throughout this day, I have been busy with other paintings, mostly finishing some that I had started earlier in the week, but all along I have been looking forward to returning to this one and finishing it up. I am glad to complete it at last, and now just kick back and read the evening away. I feel that I’ve done my last “solitude” painting on this island before the workshop arrives in the morning. I am satisfied with my output. Last summer I completed nineteen paintings in six days; this time I managed fourteen in four days. And I like this year’s paintings far more than last year’s. Having a considerable stretch of time to evaluate work from last year has been a quick trip for my endeavor this time around. My focus over the next three days will be on teaching and assisting in any way that I can. I may create some more paintings, but that is no longer my priority. I really am looking forward to working with others now. Thank you for staying with me and observing my work this week. An island always pleases my imagination, even the smallest, has a small continent and integral portion of the globe. I have a fancy for building my hut on one. Even a bare, grassy isle, which I can see entirely over at a glance, has some undefined and mysterious charm for me. I finally returned to the very first landscape I began on the first day here. Before the workshop arrives tomorrow, I am trying to finish up some of my starts, as well as begin a few new ones. I was surprised at reading this portion of Thoreau just a few moments ago, and of course the text resonated with me deeply. I envy my neighbors to the south in that gold-colored house, wondering if it is a summer home, or how often they come out to stay in it. I have not seen a human being on the premises both times I have been on this island. And there are never lights showing at night. Like this island I am on, it is small and manageable, and the grasses and wildflowers are mesmerizing.